In the middle of last month I got an unsolicited email from Tesla headquarters asking me if I wanted to upgrade my Model S. I have not seen much chatter about this on the web and the email was addressed directly to me. I have a VIN less than 5,000, so hand soliciting owners with less than 5,000 miles is not surprising. A Bloomberg reports states that Tesla is strongly pushing to show positive cash flow in the third quarter. This is X with Tesla Motors Headquarters. Today, I am writing to you to explore upgrading your Model S! Our newest release of Autopilot hardware and software will revolutionize your commute and we’d like to offer you an easy path to upgrade your Model S to a vehicle with these new features. Model S also features new options such as improved seating, Dual Motor All-Wheel Drive, Ludicrous speed, range of over 280 miles, new colors, new fascia and much more. Above all, we have made the upgrading process simple and convenient. We are also excited to share that we have reintroduced the Tesla Referral Program! From now until October 15th you will receive a $1,000 credit towards the purchase price of either a Model S/X. I had not really looked into upgrading, as I tend to hold onto cars for at least ten years unless there is a compelling reason to upgrade. But I thought I’d look into how much it would cost to upgrade my Model S. I had no interest in the Model X. There are currently four battery sizes available: 60, 75, 90 or 100 kWh. The 100kWh only comes configured as a P100D with dual drive. The 90 is also only available with the dual drive but the 60 and 75 can be configured with rear wheel drive. My main interest is battery range as I like to take long trips and have the most flexibility on when and where to charge. The following table shows the four battery options, the EPA mileage estimates, the amount of upfront cash required before sales tax, and the cost per mile. The 60 and 75 rear wheel drive version and the 90D are in the same ballpark; if you have any interest in a longer range vehicle, you are paying the same proportion in cost for more battery cells up to the 90D. The P100D is a $42,500 jump from the 90D. The 90D goes from 0 to 60 in 4.2 seconds, the P100D goes from 0 to 60 in 2.5 seconds. If I were to upgrade, I would definitely go with the 90D. The P100D’s range is not that much more for the extra cost. I live in an area with increasing congestion where it is increasingly difficult to enjoy fast 0 to 60 acceleration. I’d pay the $3,000 for Autopilot 2.0 hardware. The primary feature I would be interested in is intelligent cruise control. I’ve always found traditional cruise control generally more frustrating than anything else because there are always too many cars on the highway to maintain a constant speed. The rest of the autopilot features don’t interest me all that much. I bought the smart air suspension on my Model S in order to improve the efficiency while driving on the freeway. Unfortunately I have found very little efficiency improvements using the smart air suspension. For $2,500 and more maintenance issues, I would definitely pass on this option. I’d definitely configure the car with the Panoramic Roof for $1,500. I don’t think I have ever bought a car without some sort of sunroof. After so much hassle with my 21” tires, I definitely would choose 19” wheels. Low profile tires are just too much of a hassle on a wide vehicle. I am tired of tight parking spaces, curb rash, and the increased vulnerability and wear of low profile tires. For $2,500, I am a sucker for better sounding music in the car even though I don’t listen to it all that much. I know there are after market options, but that to me is just a hassle. This $3,000 package includes a lot of miscellaneous things. I would like to have the filtration system to some agricultural smells, and I like having a power liftgate. I don’t have any needs for the Sub Zero Weather Package, Rear Facing Seats or the High Amperage Charger. Deciding the exact color seat combination would probably be a last minute decision. I’d probably wait for the grey second generation seats in Mid 2017 that are a $2,500 upgrade. I’m happy with my black interior, but I’ve always liked grey interiors the best. I would be unlikely to get my federal tax credit of $7,500. I did not get the credit on the Roadster, and I did not get all the credit on my Model S. I am very fortunate to have retired very early in life, and my investments are tuned to only generate enough interest and dividend income to offset property tax and mortgage interest. Adjusting this even in one tax year is not that simplistic, and definitely hard to do in the last quarter of a year. The California state tax credit is a bit more complex and caught up in politics. Right now if you try to apply you will be put on a waitlist. For both my Roadster and Model S, the rebate arrived very quickly and the process was painless. Recently though the California government stopped this incentive for high income earners and increased the incentives for those with low income. California uses gross annual incomes to determine whether or not you are eligible for the income. I would not count on the $2,500 California rebate if I bought a new Tesla both for political reasons and my personal widely fluctuating income. I have to admit the number one thing I was curious about in this process was the value of my current Model S with 59,000 miles on it. The process to get a quote took a while but in the end, I would receive $41,000 plus a $1,000 loyalty credit contingent upon an inspection. I don’t have any scratches on the car but they would likely deduct some curb rash repair fees. The most likely configuration I came up with was a 90D with about half the options for $102,000. I would need to add in 9% sales tax and then subtract out my $42,000 trade in. I do still have $800 left in credit for an earlier referral but that might be used up to clean up the curb rash on my wheels. In the end to upgrade my car would cost me around $70,000! I have no interest in changing my under warranty 59,000 mile Model S for the a very similar car with a small increase in range for $70,000. In the unlikely occurrence that my Model S was totaled, I might be interested in leasing and switching the cars around till I found the perfect body size for me – even driving an X for a few years then switching to a Model 3. Upgrading a car to essentially the same car is just not all that interesting. Drivers frequently complain about the condition of the roads. In California as in most of the US, a lot of the maintenance is paid for with revenues from a tax on gasoline. In the last ten years, the amount of gasoline sold in the state has dropped by around 1.5 billion gallons, and the corresponding tax revenue has dropped by around $2 billion dollars. During this period the state population has grown. As gas prices have risen, people are choosing to drive ICE cars with better MPG. In certain areas within California, more people are commuting by public transportation or corporate shuttle busses. Electric cars are driven on these roads but do not pay any gas tax. State officials are now considering substituting the gas tax with a fee for each mile motorists drive. Reporting miles driven within a given state brings up a number of issues. With today’s technology, the government could track your cars movements through GPS. But with very valid concerns, many people would not want their every move reported to a government agency. I recommend Glenn Greenwald’s book “No Place to Hide: Edward Snowden, the NSA and the US Surveillance State” if you want to learn more about the current level of surveillance. Without GPS tracking, collecting accurate mileage data within one state would be somewhat challenging. I don’t routinely have any idea how many miles I drive within California in any given year. California has always lead the way on environmental issues. We have an easy to obtain $2,500 state tax credit on the purchase of an electric car. Also, we have special stickers to drive in the car pool lane without any passengers. So encouraging folks to buy electric cars and high mileage vehicles has been great for our air quality and helping reduce green house gases. California wants to continue to encourage not discourage these vehicles. California has more than 100,000 electric cars out of the 23 million cars on the road, which is less than 1% of the cars currently registered. In 2013, 3% of the new car sales in California were electric. Perhaps there are other methods to maintain enough funds for road maintenance. The gas tax could be increased. In my immediate neighborhood, a lot of the road maintenance is paid for by new construction and remodeling. I live in an area where homes are routinely torn down and others are extensively remodeled. The justification of this tax is that all these heavy trucks used during the construction process deteriorate the local roads. The taxes from these construction projects provide a significant amount of money into the local coffers and the roads are subsequently in good condition. California officials do not expect any short term change to the taxation methods. This post may perhaps be the most frustrating post I have written on this blog. Back in 2009 when I bought the Roadster, I did not get the federal tax credit of $7,500. I could have bought the Model S in 2012 but delayed the car purpose solely for tax reasons. I unfortunately took a $5-10K depreciation in my Tesla Roadster during this four month period because of the glut of them on the market when I did eventually sell it. I worked with my investment advisor and adjusted my investments to ensure that this would happen during 2013. At the end of 2013, when looking through the results of my investments, the numbers clearly indicated that I had more than enough income in those categories for that tax credit. My tax advisor also has full access through the web to check my accounts and never contacted me. In April, they sent me a deferred tax form because I have K-1s that are issued much later in the year. In late September, I finally received my completed taxes. The first amount I checked was this electric car credit. I was simply shocked that I only received a third of the amount after this detailed planning. After a series of emails, my tax accountant indicated that my taxes were simply incorrect as some accounts were not even on the statement! After some discussions with the two professionals, they found a missing account. But even with a large addition of the correct category of income, I was now informed that this income was foreign and did not qualify! At no time did she tell me that I needed to make sure all of this income was generated in the United States. In the end, I only received $200 more of the federal tax credit. After very clearly stating my point of view, I sincerely feel that my tax accountant was negligent in informing me sufficiently how to obtain this credit. By missing a very important detail such that all the income needed to be generated in the US, I lost this credit. All of the tax accountant’s correspondence historically has been terse. Fortunately, they did agree to not charge me for this years returns, but I am still underwater for the credit. Needless to say, I will never use this high priced firm again who really is simply a number crunching firm. Although I would rate their service very low, I am not going to name them on this blog. Ironically I volunteer to do taxes for low income people and did my own taxes for many years. But for some unknown reasons, turbotax actually chokes on my tax information. I currently have four interviews set up with recommended accountants and am going to try to run Turbotax on my 2013 return. California gives every electric vehicle owner a rebate when buying their car. They also recently sent a demographics survey from the Clean Vehicle Rebate Project in order to understand the buying process. The survey consisted of about thrity questions. And fortunately, you can skip any question you are not comfortable answering. The survey is a typical marketing survey with reasonable questions. 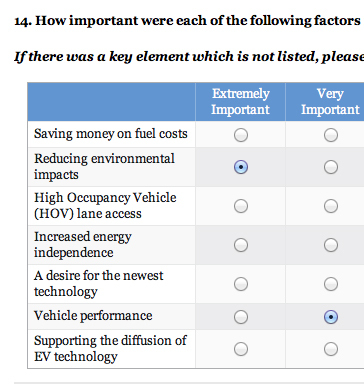 They were also trying to asses whether the EV buying experience addressed issues such as electricity rates, range, home charging etc… The whole survey was well written but a little unusual for someone like me who was actually replacing one EV for another. The survey also requests the buyers to download their Green Button energy use data. I had never heard before of the Green Button program. The effort is from the utilities in response to a White House call to action. The personal energy usage data is standardized in a consistent and machine-readable form. The end user can use the file or send it to a third party such as the Clean Vehicle Rebate Project. The data in the green button program is not any different than the other data I have churned through before to figure out my energy usage. But hopefully some sort of standardization will enable third party developers to help us use energy more efficiently and help us analyze trade-offs of different rate plans. 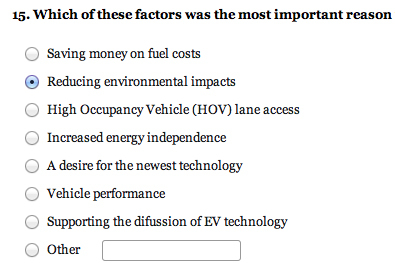 Two questions I found the most interesting and I would like to see the results from the general population that would be questions 14 and question 15; both questions address the motivations for buying an electric car. I was a very early adopter of electric vehicles because of my concern about the environment. Since the Model S is such a fantastic car, many people are buying the car for performance reasons. I have also heard that it is the ‘it’ prestige car and a ‘status symbol’ now here in Silicon Valley. I also recently heard someone (likely with some envy or other issue) in a crowd disparage Tesla owners claiming they were environmentalists; I chose not to respond. California is leading the way in the United States for incentivizing green power. If you buy a model S, the federal government has a $7,500 tax credit. California tops that off with a $2,500 check, which is independent of your taxes. Several cities within California have similar incentives for electrical infrastructure. Palo Alto recently is the first city to require new homes be built with pre-wiring for in-home vehicle chargers for all new housing construction. The cost to the builder will be only around $200. 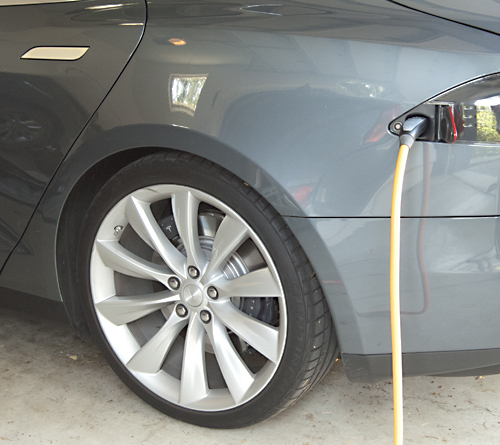 Retrofitting a charger can cost considerably more to bring 220 Volts into a garage. Both Lancaster and Sebastapol now require all new homes to be built with solar panels. Lancaster was the first city this year to pass this requirement. Lancaster is the 30th largest city in California located north of Los Angeles and is actually in the mammoth Los Angeles county, which is large in both square miles (4,083) and population (around 10 million). All newly built single-family homes in town on lots greater than 7,000 square feet and rural lots greater than 100,000 square feet must have a solar system. Since Lancaster is located at 2,350 feet at sea level and has sunshine at least 300 days per year, the location is great for solar production. Sebastapol is in Northern California north of San Francisco. All new homes are required to include solar systems that offset at least 75% of the building’s total annual electric load. If the location is not ideal for solar, the builder must pay a fee or look into other means of alternative energy. Solar has been adopted quite widespread throughout the state. 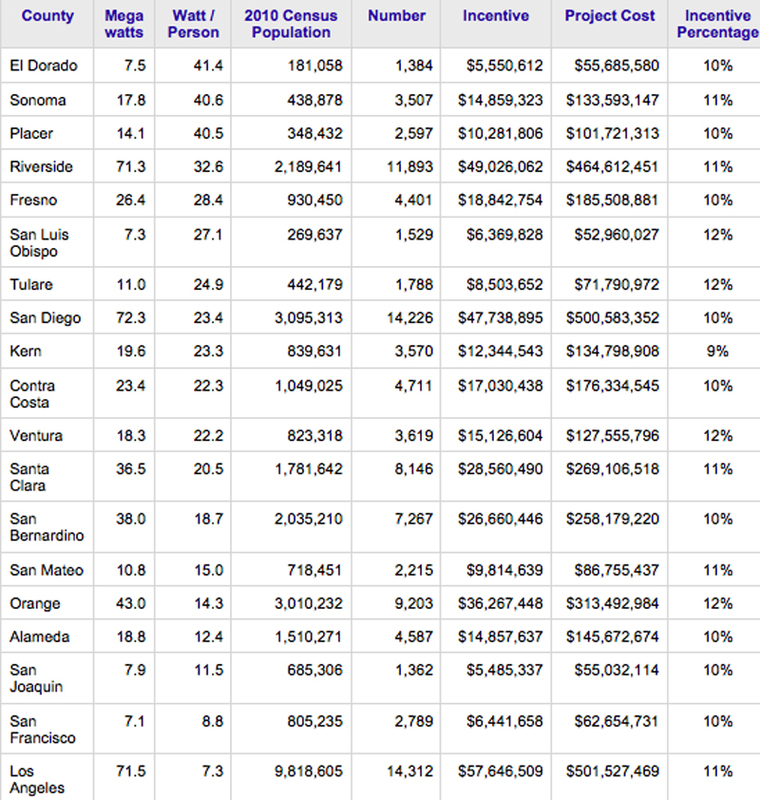 California provides this data on a zipcode or county basis. The top 3 counties of solar adoption in California per person include El Dorado and Placer counties, which are near Sacramento, and Sonoma county, which includes Sebastapol. The following table covers 19 of the top solar producing counties in California through November 20, 2013. The data covers 83% of the state as many of California counties have small populations in contrast to a few very large counties. The largest Watt / person statistic is 41.4 in El Dorado County and only 7.3 in sunny Los Angeles County. The San Jose Mercury News published an article that contains some interesting statistics and trends about the gas tax and gas consumption in California. Gas consumption has dropped in the last six years and dropped 2% in the first two months of 2013, perhaps due to the Model S? On Monday July 1, California gas taxes are increasing by 3.5 cents per gallon for a total of almost 72 cents per gallon. The nationwide average gas tax is 49 cents and California has the highest tax in the nation. Due to a number of factors including electric cars, more fuel efficient vehicles and the recession, the number of gallons of gas sold in California dropped from 15.9 billion in 2006 to 14.6 billion in 2012. In the first two months alone of 2013, the consumption of gas was down nearly 53 million gallons, or about a 2 percent decrease. This two percent decrease occurred at the same time when the Model S production ramped up! A typical person who drives 15,000 miles a year at 20 mpg pays about $479 per year. This tax increase adds about $25 per year to the bill. Essentially a Model S is receiving from California a yearly rebate of about $500 per year. A somewhat hidden financial incentive to drive an EV. Outside of the normal sales paperwork, electric cars have additional paperwork in California. The federal tax credit is part of the annual tax program, but Californians can get $2,500 from the state very quickly along with access to the carpool lane. The Center for Sustainable Energy in California, requires four documents in order to issue a check. The application form, proof of vehicle registration, a copy of the sales or lease contract with full itemization, and a copy of a California utility or cable bill within the last three months. The center currently has plenty of funds. I found them to be very friendly and helpful. They quickly processed my information and issued a check in a reasonable amount of time. With the carpool stickers on an EV, you can drive in the carpool lanes with only one person. With a new car, you need to wait till you get your license plates, which in California takes less than two weeks. The process to get the stickers is simply to fill out a form, and send in a $8 check. I have my stickers but I am avoiding putting them on until I will be driving on at least a somewhat routine basis where they could be useful. 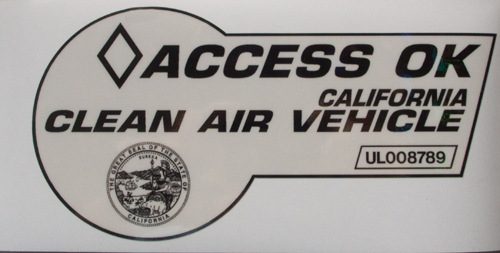 Right now, the white carpool stickers will expire in Jan 2015, but they will likely be extended to a further date.